The findings of the Police Ombudsman investigation into one of the North’s deadliest attacks were leaked before their official publication on Friday. The investigation found no evidence that police colluded with the loyalist killers. Children and pensioners were killed in the bar in north Queen Street in December 1971. Among the dead was pub owner Patrick McGurk’s 14 year old daughter, while his wife Philomena McGurk, 46, a mother of four, also died. Mr McGurk, who died in 2007, and his three sons were also injured in the blast. Although the IRA was blamed for the bombing, seven years later an Ulster Volunteer Force man received 15 life sentences after he was convicted of the bombing. The driver of the getaway vehicle, he remains the only person ever to have been convicted in relation to the explosion. Victims’ families have called the report which took four years to compile “an utter disgrace”, saying victims’ names have been omitted. Alex McLaughlin, who lost his father Thomas in the bomb, has called for an independent public inquiry into the bombing. “As far as we’re concerned the Ombudsman can take the report back. We’ve waited four years for this and today’s report hasn’t eased anything as far as the family is concerned. Gerard Keenan, who was only 13 years old when both his parents were murdered in the explosion, has wrongly been described as one of the deceased in the report. The families have always believed that the UVF must have been assisted in their attack on the pub. On the night of the attack, hundreds of troops saturated Belfast’s city centre, and there were cordons and searches “at every turn”, according to one witness. The pub itself was frequented by Official IRA members, and the bomb would have been strategically planted to fan the flames of the split with the Provisional movement and bring a feud onto the streets. A breakthrough document was uncovered by the victims’ families in July 2009. 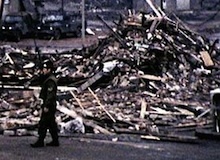 Prepared for the General Officer Commanding the British forces in the North of Ireland at the time, Lt. General Sir Harry Tuzo, this Director of Operations Brief showed that the Army Technical Officer on the scene minutes after the explosion believed, in his expert opinion, the bomb “to have been planted outside (author’s highlight) the pub”. This was diametrically opposed to the fiction that the British military and the RUC told repeatedly afterwards, that the bomb detonated inside the bar and was an “IRA own goal”. However, in his report, Ombudsman Al Hutchinson claimed there was no suggestion the RUC/PSNI did not conduct a thorough investigation. He also dismissed allegations of collusion. The report found only that senior RUC men let the mistaken public belief that the IRA was responsible go unchallenged. This was despite the fact that a retired military information officer interviewed by the ombudsman said that within a day of the attack the military were aware of UVF involvement.